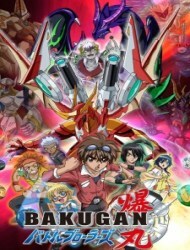 Plot Summary: Dan, Marucho, and Shun get caught up in a war between two different alien factions in another universe, and teaming up with three new brawlers: the Neathian, Fabia, the new human, Jake, and the Gundalian, Ren, in order to stop the evil Gundalian Protectors, the Twelve Orders from destroying Neathia, and possibly, Earth. They meet these people by them entering through the virtual reality Bakugan Interspace. The stakes are high! Will the Battle Brawlers triumph, saving the Bakugan once more?